Osip Mandelstam was a Jewish Russian essayist and poet who was unfortunate to live at a time when intellectuals of his kind were cruelly persecuted by the Soviet authorities. He belonged to a literary group called the “Guild of Poets” who followed Acmeism, demonstrating compactness and clarity in their poetic expression. This movement’s name comes from a Greek word acme and it is hugely ironic, considering the terrible times in which he lived, that the translation of that word means “the best age of man”. He was born Osip Emilyevich Mandelstam on the 15th January 1891 in Warsaw which was, at that time, in the Russian empire. His father was an affluent leather merchant and he received dispensation to move the family to St Petersburg where Osip went to Tenishevsky for school in 1900. He was in good company there, the school having seen a number of significant cultural figures, such as the poet Vladimir Nabokov, already pass through its gates. Osip was soon writing his own poetry and he saw several pieces published in the school’s almanac during the year 1907. The following year he was in Paris studying philosophy and literature at the Sorbonne but was unable to settle to his studies. He was soon on the move again, this time to Heidelberg University in Germany and then back to St Petersburg. He had to convert to Methodism to enrol at the university here as Jews were not allowed. Still he did not commit to anything and he left the university without a degree. 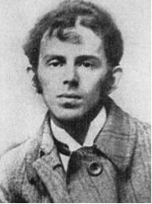 Mandelstam was described as a populist poet in his early days and, on joining other writers in the Guild of Poets in 1911, he became involved in symbolist imagery. He was nominated to pen the manifesto for this group who were often named as “Acmeists” and his first set of poems was published in 1913 and called The Stone. He continued to write despite the difficult post-Revolution conditions that many Russians were living under, especially Jews. His second collection of poems, which was titled Tristia, was published in 1922 and, after this, Mandelstam kept a low profile for a number of years. He concentrated on translating works into Russian and the occasional spell of journalism. 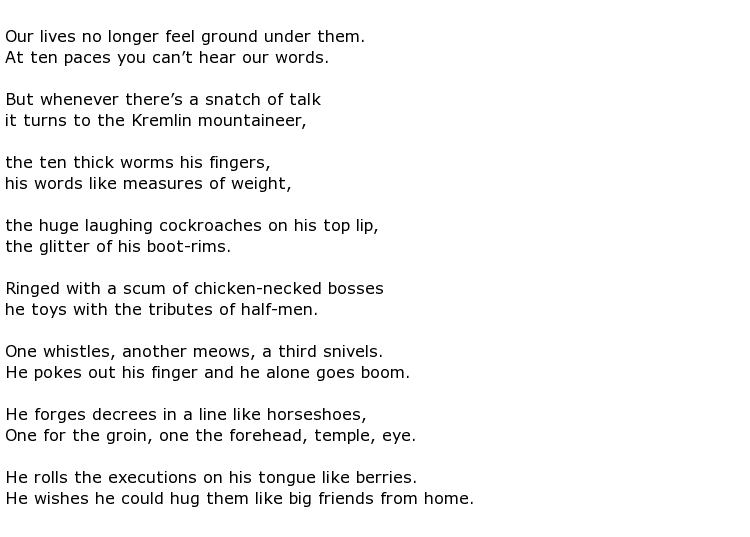 This poem was read at private gatherings in Moscow and it was probably the beginning of his demise. Within six months he had been arrested and was sent into internal exile taking his wife, Nadezhda, with him. Historians have suggested that he might have received a much more severe sentence but for the personal interest that Stalin took in his work. He and Nadezhda were given relative freedom of movement during their exile and could choose where to live. He seemed to have earned temporary respite from that before being arrested once again, in 1938, and this time there was no escape. He was sent into exile in Siberia this time but did not survive the journey, dying in a transit camp along the way. Despite writing a sympathetic “Ode to Stalin”, the “Great Purge” was under way and writers and intellectuals like him were persecuted and accused of being anti-Soviet. He was shipped east but only got as far as a transit camp called Second River (Vtoraya Rechka) near Vladivostok. Osip Mandelstam died of an illness that has not been specified on the 27th December 1938 aged 47.